It may sound like we’re beating a dead horse, but we have been sounding the alarm about the dangers of prescription and over the counter pain medications for years. Amazingly, these medications cost insurers millions of dollar per year – with terrible results! A new study released by the Centers for Disease Control and Prevention (CDC) confirms just how dangerous prescription drugs can be.According to their new data, deaths from prescription pain drugs have tripled since 1999. Misused prescription pain medications currently kill approximately 15,000 people in the US each year, which exceeds deaths from heroin and cocaine overdoses combined. Ultimately you and I pay the price through increased insurance premiums. The real solution is to expose the lies put forward by Big Pharma in pushing pills that are just as dangerous—and addictive—as illegal drugs. Plus, we need to get the word out that there are far safer—and ultimately more effective—ways to manage pain. 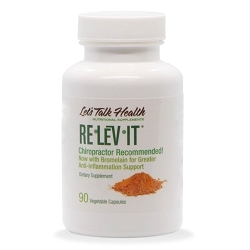 You know Relevit – our best-selling pain support formula for the past 8 years – has made a difference in the lives of thousands of Let’s Talk Health members. Remember…Relevit provides this type of pain support naturally without the side effects associated with prescription and over the counter drugs. If you experience chronic or occasional pain – like 50% of Americans do weekly – give Relevit a try – you may just take the edge off of your pain and save your life (and pocketbook) in the process.